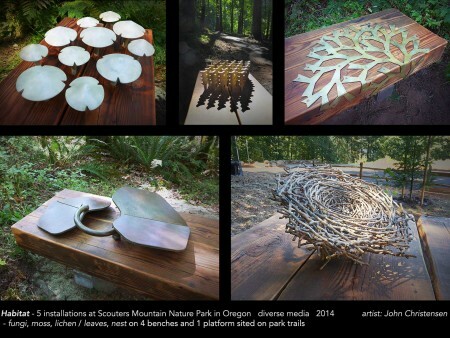 The City of Happy Valley in partnership with Metro, North Clackamas Parks and Recreation District and Clackamas County Arts Alliance commissioned artist John Christensen to create a site-specific art installation at Scouters Mountain Nature Park. The installation includes 5 benches scattered along the trail system of the park giving visitors a place to rest and provides an element of surprise and wonder to find such treasures in the forest. The theme of habitat, of creating habitat, captured my attention during my site visit to Scouters Mountain,where various habitats were championed – a mossy culvert, piles of rocks and brush, fallen trees, messiness – anything that creates small contained spaces. I was impressed by how dramatically Scouters Mountain would be an anomaly, an island of old-growth forest ringed by expansive suburban sprawl. My research focused on colonizing, small, often primitive growth – ferns, fungi, mosses, lichens – that create, like Douglas firs and humans, a dominant biotic cover for a given place, scale and set of conditions. I approximated their forms and magnified their scale – to provoke our attention to small things – and set them occupying space on benches – to suggest that we need to share the world with other forms of life. In nature, the represented biotic forms – leaf-clutter, lichen, moss and mushroom colonies – create micro-environments that harbor small organisms. 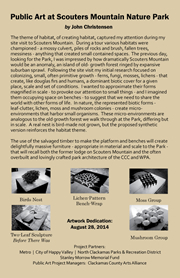 These micro-environments are analogous to the old growth forest we walk through at the Park, differing but in scale. A real nest is bird-made not grown, but the synthetic version reinforces the habitat theme. 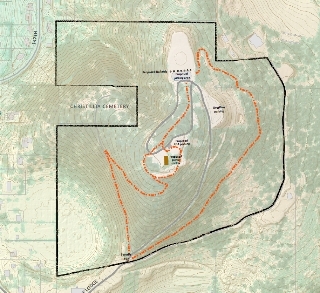 Scouters Mountain Nature Park is a day-use park open from dawn to dusk and located north of Sunnyside Road off 147th Avenue in Happy Valley, Oregon. This 80 acre caldera site is part of the Boring Lava Field and rises more than 700 feet above the valley floor offering beautiful views of the surrounding area and Mt. Hood. The park includes nature trails, a new picnic shelter with terrace, and parking areas which are currently under construction. The park is anticipated to open in August, 2014. The Boy Scouts of America Cascade Pacific Council formerly owned the site prior to its sale to Metro in 2011. The Boy Scouts’ Chief Obie Lodge was originally situated where the new picnic shelter is being built. The lodge was dismantled and some of the materials from the original structure are being used in the design of the new shelter. Remaining salvaged timber and boulders may be available to artists interested in sustainable design practices. Please reference the links in Supplemental Information on Page 4 for more images and information. An abundance of vegetation, wildlife and park trails offer a wide range of nature experiences for visitors. Future plans for the surrounding areas include linking more trails and new residential developments which will put the park at the core of the community and provide a natural gathering place for a variety of activities. The dedication of the artwork on August 18, 2014 included a guided tour of the artwork by Artist John Christensen.